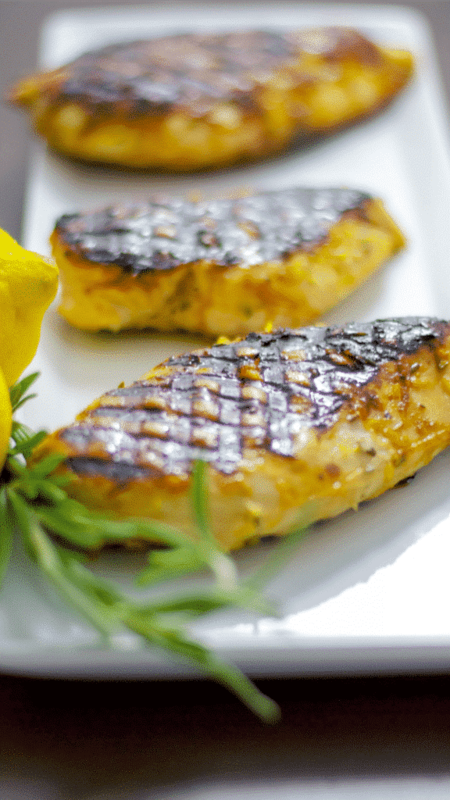 Boneless chicken breasts marinated in a combination of honey, lemon juice and rosemary; then grilled is a healthy, low fat delicious weeknight meal. You can really learn a lot in a year without even realizing it. Last year, I can honestly say I used to burn or just about overcook everything I tried to grill (to the point of shoe leather! ), but I have to say, though I’m not perfect yet, I am doing a much better job. 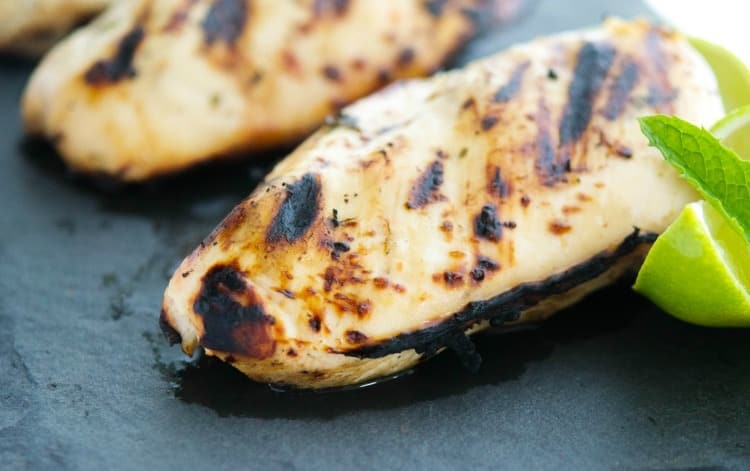 After you fire up the grill, don’t poke the chicken. Instead, use tongs to turn it over. Using a fork to turn the chicken pokes holes in the meat, thus letting some of those juices go to waste. The only time you need to cut into the meat is when you are cooking a whole chicken and it is almost done. One trick I learned for grilling chicken on the bone is to simmer it in water first. Add chicken pieces to a large pot, cover with water, bring to a boil then reduce to a simmer. Then allow to simmer for approximately 15-20 minutes. You can do this with or without the skin on. This accomplishes several things. 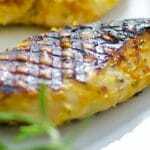 One: The chicken doesn’t dry out on the grill (especially when using chicken breasts) before it has time to cook through. It also won’t have that completely charred bbq sauce on the meat; which if you’re like my family, the kids refuse to eat! Two: It reduces your grilling time which is helpful if you’re entertaining for a large crowd. 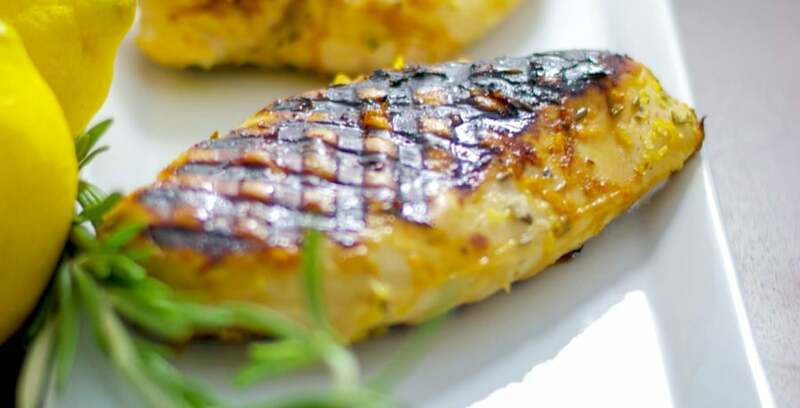 Three: If you are cooking for a crowd, you can prepare the chicken ahead of time, even the day before the event, so you can spend more time with friends and family and less time sweltering over the heat of the grill…BONUS in my opinion! Grills vary, thickness of meat, bone-in or bone out, skin or no skin, and even the weather all effect the cooking times of chicken. Use a meat thermometer, look for golden brown skin, clear running juices, and monitor closely to cook to the best doneness. Get a grilling thermometer. The recommended internal temperature for chicken when it is finished is between 165 – 175 degrees and the juices run clear. Don’t serve the chicken right away. Let the chicken “rest”. For grilling a whole chicken let it sit for about 15 minutes after taking it off the grill and before carving. For chicken pieces let them sit for about 5 minutes to let the juices run back into the meat. The chicken will be much juicier this way! 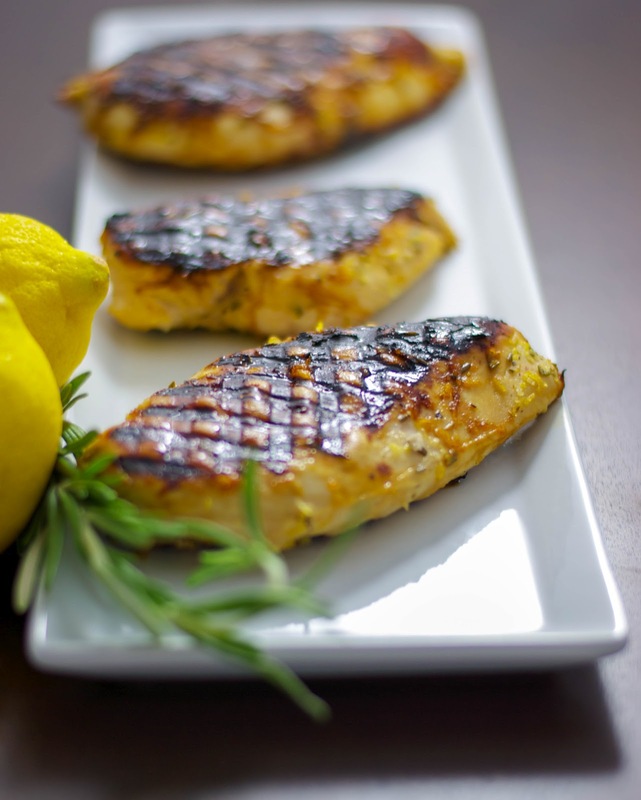 You can’t get any simpler than these Honey Lemon Grilled Chicken Breasts and the flavor was INCREDIBLE! 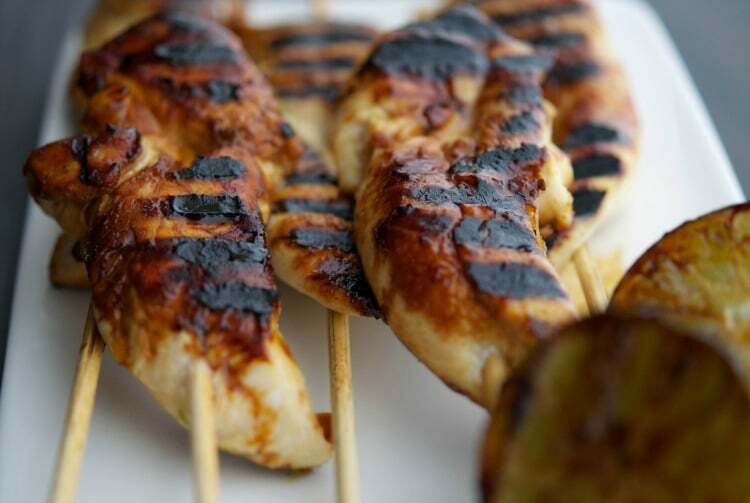 Sweet, tangy and woodsy all in one made this one of my favorite ways to marinate chicken. ~Enjoy! Add the honey, lemon zest and juice, and rosemary to a bowl and whisk until well blended. Place the chicken in a resealable plastic bag; then add the honey mixture and refrigerate for at least 2 hours or overnight. 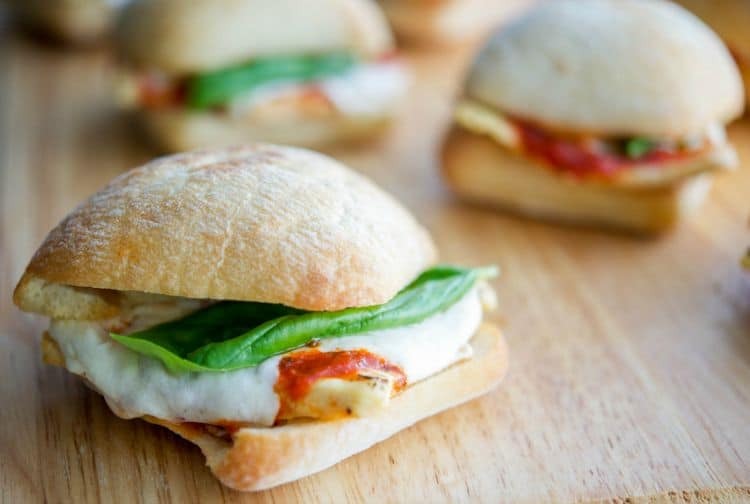 I would love this with a side of veggies and brown rice for my lunch today! Looks spectacular! Congrats to all those winners!!! And love all of the tips. Personally, I have not tried the simmering in water. I do like to brine my chicken first which accomplishes everything you say the simmering does without drawing out the flavors into the water…IMO only. About the single most useful tip I ever got about cooking chicken is to buy that thermometer. measuring internal temp, and pulling the pieces of the grill at the right time insures juicy and delicious! I must agree with Dave regarding the brine. If you simmer your chicken first, especially with skin-on pieces, how do you maintain a crispy skin? Carrie, what great tips! I boil ribs before grilling but never thought about doing so to chicken, will have to give it a try. We’ll also be trying your glaze, sounds perfect! Thanks for sharing. This looks amazing!! Definitely have to try !! Oh heavens, these look like the best! Thank you for site. Awesome idea. Have a nice day!